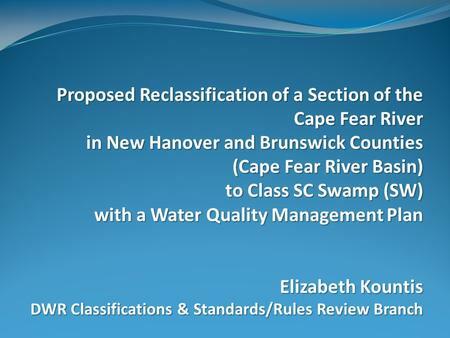 Water quality management plans generally aim to attain, maintain or enhance water quality, but a recent such plan for managing a portion of the Lower Cape Fear River (LCFR) does the opposite. The LCFR is designated as a “Primary Nursery Area” and is therefore entitled to a higher level of protection due to its vital role in supporting a healthy fish population. 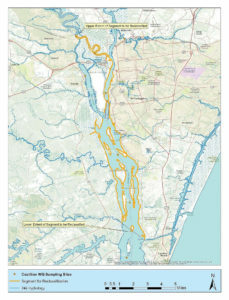 The LCFR is also designated as an “Anadromous Fish Spawning Area” supporting populations of striped bass, American shad and two endangered species of sturgeon. But, due to nutrient runoff which research suggests is primarily coming from Concentrated Animal Feeding Operations (CAFOs), much of it has low pH levels and low Dissolved Oxygen (DO) levels, which negatively affect the aquatic life of the river. The pH and DO levels are two primary parameters on which the state issues water quality standards, based on the type of waterway being assessed. Since 1998, the state observed that a portion of the LCFR was not meeting its water quality standards and it has been listed as “impaired” since that time; however, no action has been taken to remediate the impairment. Scientific analysis has been repeatedly presented to the state indicating that the low DO and/or pH is the result of poorly regulated waste management practices at the thousands of CAFOs in the Cape Fear Watershed. Rather than proposing plans to enhance water quality, the state approved of a proposal to lower the water quality standards instead. In 2014, the Dpt. of Environment and Natural Resources (now Dpt. of Environmental Quality) concluded: “…the standards include an ‘out’ for natural conditions, and we have developed a protocol that EPA concurs with…and have successful de-listed waters with naturally low DO and/or pH…” Put simply, they reclassified a portion of the LCFR as a Class SC (swamp) based on what they deemed were ‘natural conditions’ – ignoring the scientific analysis proving otherwise. Why Is It a Clean Water Matter? The state has started on a slippery slope of seeking a legal way out of working to improve water quality by simply lowering the required standards instead. If this change gets signed by the EPA, we may see this response to poor water quality across the state. It saves public money by not requiring the state take any action, and supports private interests by allowing for further deregulation of industry. Since the waters do not even meet the standards required for swamp classification, the agency proposed a water quality management plan along with the reclassification proposal. In it, they ironically agreed that the management plan should focus on ‘point source’ pollution (e.g. identifiable sources from industry or sewage treatment facilities), indicating they were aware that the claim that they reclassified it based on ‘naturally-occurring low DO/pH’ — was baseless. But, the plan proposed does not provide any meaningful limitations on point-source pollution, nor does it address CAFOs. It also fails to adhere to the requirements under the Endangered Species Act by not providing any specific protections for the endangered species that rely on these waters for spawning and as juvenile fish habitat. For details on this issue, read the comments submitted by the Southern Environmental Law Center on behalf of Cape Fear River Watch and others on this issue in 2016. Cape Fear River Watch worked with the Southern Environmental Law Center to curtail this attempt, but the state has moved it forward. The rule was adopted by the Environmental Management Commission (EMC) and approved by the Rules and Review Commission (RRC), which makes it effective under state rules. It was sent to EPA for final federal approval. DEQ needs to reverse this designation. If they do not, CFRW and SELC are prepared to take legal action. Brunswick County residents get their household water from the Cape Fear river. Water quality should be maintained to the highest level possible. It has clear running water definitely not a SWAMP!! Thank you for reading and for your response, John. You are right on! If you have not signed the petition – please do – and feel free to share with your friends and family. We really want the DEQ to hear what the public thinks about this!